…you know, I’m not going to list the products I used. I’m going to tell you what I did. I took a 1″ paint brush and wet it, then made sure to saturate it with as much black eyeshadow as I could. I then closed my eyes and grabbed the brush and smeared it across my eyes with my eyes closed. I got the rest of the pigment off the brush by randomly dabbing it around my eye area. Then I put black eyeshadow on all of my fingers, rubbed my hands together, and wiped them across my eyes as though I was wiping sweat off my brow. Heavily lined just the bottom of my eyes with a dull black eyeliner and dragged it out towards my temples. Then went back with liquid eyeliner to add the war stripes. Finally, I drew lines down my chin from my lips and filled in my top lip with black eyeliner. Makeup ain’t always glamorous! Sometimes it’s FIERCE. 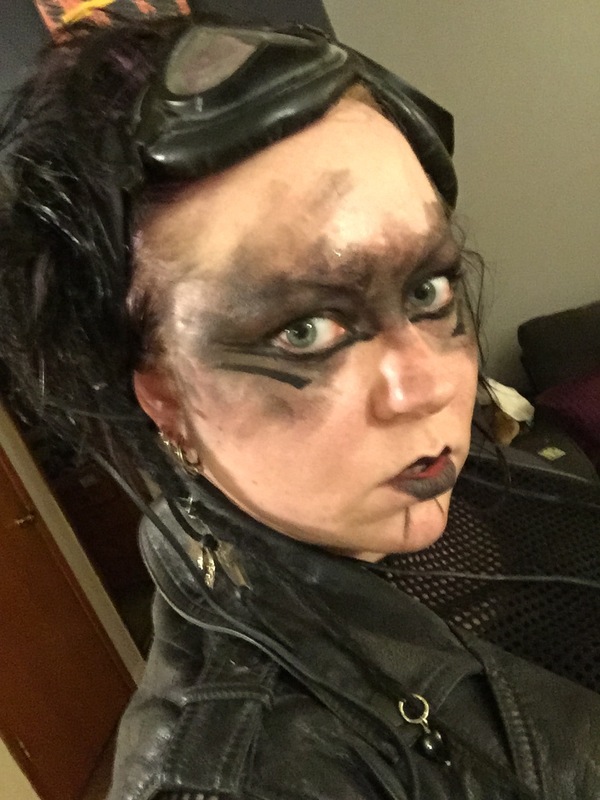 This entry was posted in Extras, Makeup of the Day and tagged cosplay, costume, fury road, goth girl, mad max, theatrical makeup by Kristin. Bookmark the permalink. How was the event? I don’t have to tell you that you nailed the theme. It was fun as hell. The entire club was full of people dressed up in their best Mad Max inspired gear – pretty impressive when you consider that getting Seattleites to dress up for ANYTHING is like herding cats and pulling teeth at the same time.